transformer is dropped or severely jolted. The lifting equipment, including the slings, should be carefully inspected before the operation is started. The linemen and groundmen should stay clear, while the transformer is raised into position. Appropriate personal protective equipment must be worn at all times. 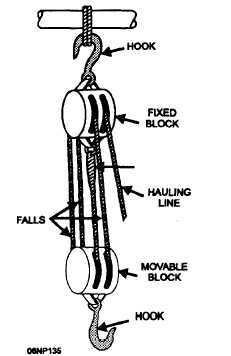 Block and tackle are used for applying tension to line conductors when sagging in, for applying tension to guy wires when hoisting transformers, and for other general-purpose hoisting. The use of block and tackle has two advantages: (1) the user can stand on the ground and pull downward while hoisting or lifting a load and (2) the manual force applied need only be a fractional part of the load lifted. Figure 4-40. - Pole gin. determined by the number of ropes (four), not counting the hauling line running from the movable block. Whether lifting with the block and tackle or a winch, you will also need lifting straps or slings to se- cure the equipment being lifted to the lifting apparatus. Figure 4-41. - Block and tackle.